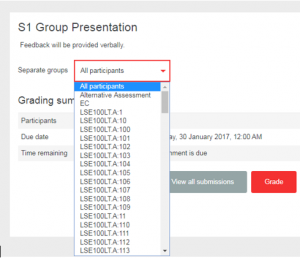 Using the Groups feature of Moodle you can divide the students on your course into groups for collaborative activities such as discussion forums or wikis so they can experience greater interaction and closer working than is likely to be possible in a whole class exercise. Groups also make it possible to allocate student assignments to different markers. Once groups are created, there is also an option to create groups of groups known as groupings. See Create and use Groupings. Groups can be created manually, automatically (via auto-create groups or enrolment key) or by importing from a spreadsheet. 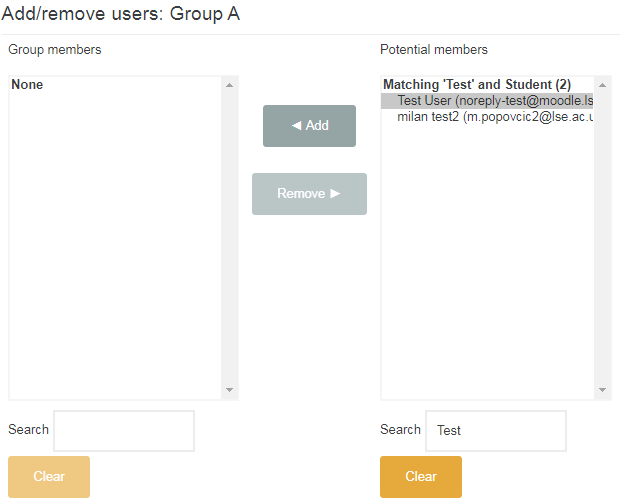 Click Groups in Course administration/Users. On a course with no groups you will see a screen with two empty columns (Groups and Members of) as below. Click Create group. 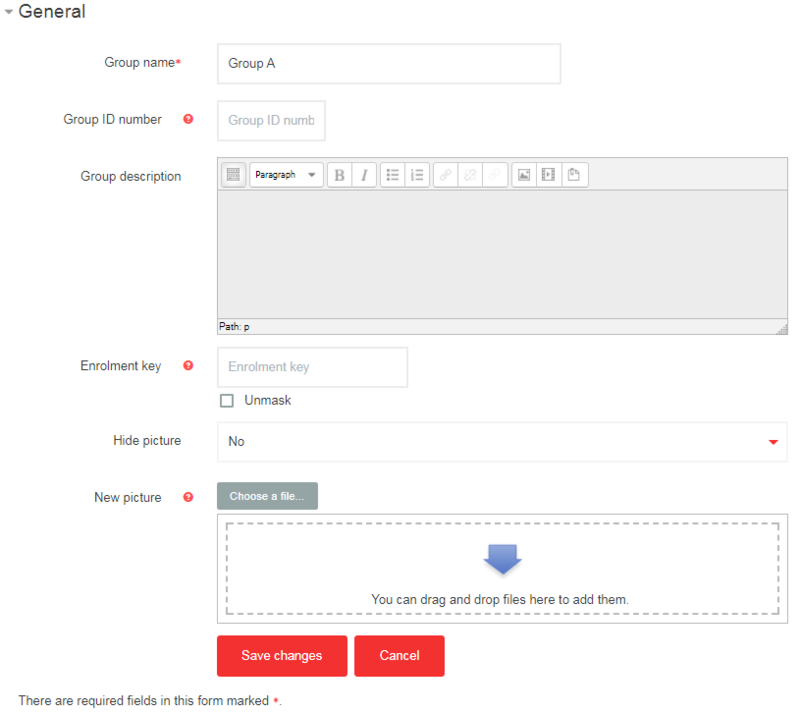 Provide a group name and, optionally, a description and picture. Click Save changes. Repeat this process for every group that is needed. 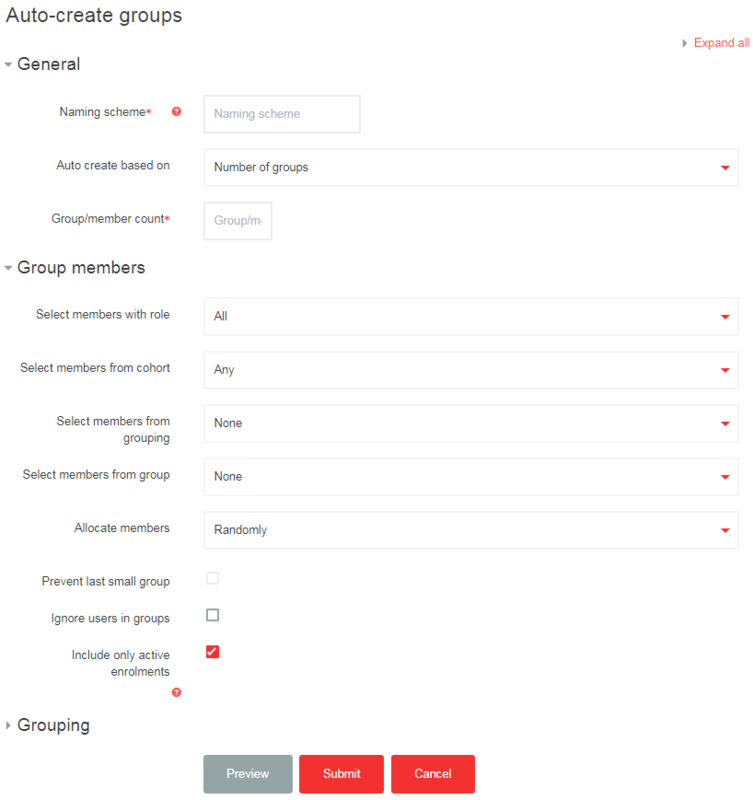 To add members to your groups, click a group in the Groups column on the left and click Add/remove users on the right. A list of potential members will appear in the right hand column. Select the students you require and click. N.B. with larger numbers of students (potential members) you will not see names listed as below – you will have to use Search to locate students. The selected students now appear on the left. Click Back to groups to repeat the process for other groups. If you want to randomly allocate all students on a course to a group, you may find this method more efficient. Click Auto-create groups on the Groups page. Naming convention – to have Group A, B, C etc., use Group @. To have Group 1, 2, 3 etc. use Group #. Decide whether the creation process is based on the number of groups (default) or members per group. The role to be included in groups. For example, you may want to limit groups to registered students and exclude auditing students. Decide whether group members are allocated completely randomly or by name. If you specify members per group, it is usually advisable to select prevent last small group. This means that, rather than creating a final group smaller than the rest, members are dispersed to existing groups. 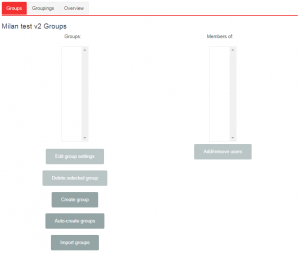 You can also use Grouping to allocate the newly created groups to a new or existing grouping. See Create and use Groupings for more information. Once groups are set up, you can create group activities. At LSE, the most common activities to which groups apply are forums, wikis and assignments. 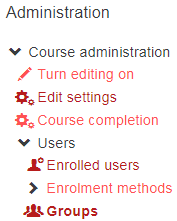 Return to the course page and Turn editing on. Create a new activity or update (Edit settings) an existing one. Complete the other fields as normal. In Common Module settings use Group Mode to activate groups and specify how you want them to work on this activity. You can select Separate or Visible groups. If you choose the former, students work in private groups. Visible means members of other groups can view, but not participate in the activity. Once saved, the activity is available to each group on the course i.e. you do not need to create the activity multiple times. Once group activities are set up, you can use the drop-down menu at the top of the activity to select a particular group.